LSU is one of the top dunking teams in the country. In one of the most intoxicating games of this year’s NCAA Tournament, the UCF Knights went toe-to-toe with the top-seeded Duke Blue Devils. Leading up to and throughout the game, considerable bandwidth was spent debating whether the soon-to-be top pick in this year’s NBA draft, Zion Williamson, would add another body to his posterized graveyard. UCF center Tacko Fall, the would-be victim, chipped in 15 points on seven made shots, each of which came in eerily similar fashion. They were all dunks. At 7-foot-6, Fall is genetically predisposed to excel above the rim, as evidenced by his ability to jam it, flat-footed. Nobody this season dunked on Mike Krzyzewski’s squad more than Fall and the Knights. But the Blue Devils, which ultimately moved on with a win, are even more dunk crazy. And they aren’t the only team still playing in this tournament with eyes trained on the rim. This season’s Sweet 16 features a number of teams that relish slamming the ball through the cylinder. The teams have combined to produce 1,866 dunks this season. Three of the four dunk-happiest teams this season — Florida State, Duke, and LSU — are still in the field. Another contender, Gonzaga, ranks in the top 10 while Auburn, Virginia, Tennessee and Michigan rank in the top 30 by this measure. 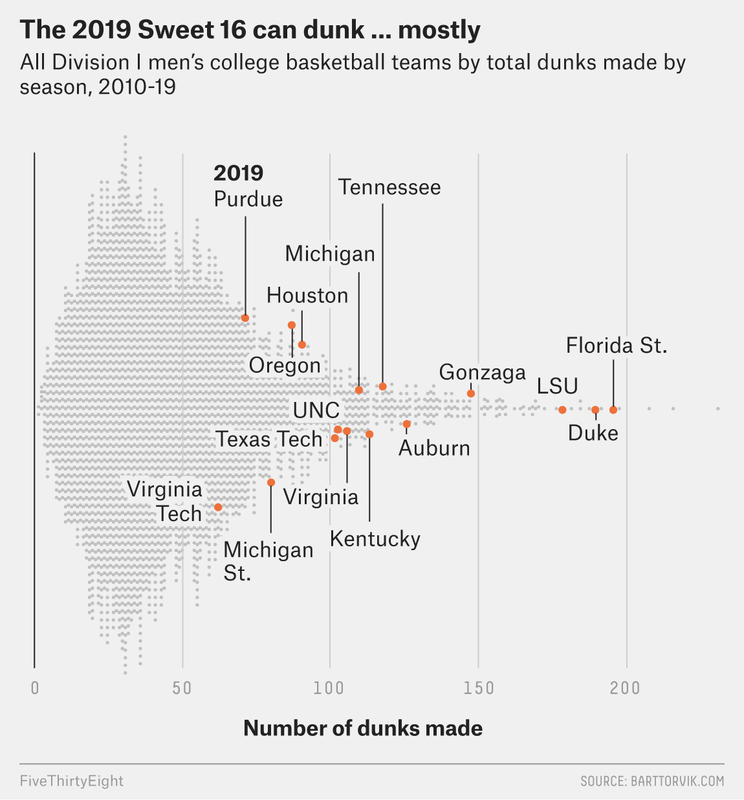 In all, six of this year’s Sweet 16 entries have a dunk share1 exceeding 10 percent. Four years ago, only one did. To be sure, some of this is intuitive. Advances in science and technology make comparing today’s college athlete to those of yesteryear a comical examination. Perhaps more than ever, basketball rewards height — and, increasingly, arm length — and athleticism. Nowadays, warm-up lines seem to be as much for the fans as for the players. Tennessee is credited for starting a choreographed dunk during warm-ups that involves the entire team. It spread around the country and even reached the NBA. The digital market is saturated with looped clips of diminutive high-flyers, players leapfrogging multiple humans and guards audaciously double-pumping in transition. The NCAA’s official website ran a listicle of players it wants to see in a dunk contest.2 Because of his dunking prowess, Williamson eclipsed 1 million Instagram followers before he even got to college. As the number of dunk attempts has spiked, so too has their importance. Dunks accounted for 5.4 percent of all 2-point field goal attempts this season, the highest portion since 2014-15, and the fourth consecutive season that the national dunk share has risen. In fact, according to Bart Torvik’s website, three3 of the 12 teams with the most single-season dunks since 2010 can be found in this weekend’s regional semifinals. Of course, there are outliers. Most noticeably, Loyola-Chicago made a surprise run into and past the Sweet 16 a season ago. The Ramblers had just 15 dunks, accumulating a 1.6 percent dunk share. Duke squares off with Virginia Tech on Friday and has a clear edge on dunking; the Hokies (62 dunks) have fewer than a third as many dunks as the Blue Devils (188). But far more often, it seems that the high-flyers are moving on. Dunks have held a special place in the NCAA Tournament for decades. It’s how many came to know the UNLV Runnin’ Rebels. It’s where Florida Gulf Coast, a plucky No. 15-seed in 2013, became known Dunk City. They have been everywhere this season and will continue to be, particularly with the regional semifinals featuring Florida State, Duke and LSU, three teams that have already skied for at least 177 dunks. The play has elevated the entertainment of the sport by a considerable measure. 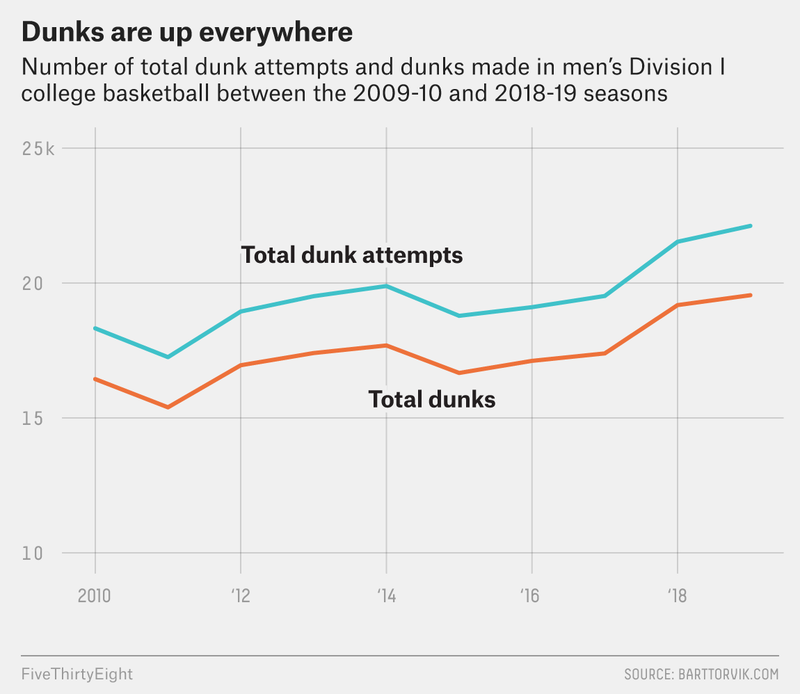 While the rise of the 3-pointer has justifiably garnered much attention, the dunk is the sport’s most marketable shot. The feat of athleticism is frequent fodder for highlight reels and commercials. And, since nearly 90 percent of all dunk attempts since 2010 have been converted into points, it’s likely the most efficient shot in basketball. What was once banned is now propelling the sport forward. So keep your eye on the rim this weekend as the Sweet 16 takes flight. The percentage of 2-point field-goal attempts that were dunks. Some posit that college already boasts the better contest. Duke, Florida State and LSU.